Look, it's an action figure that knows it's an action figure. After crash-landing on a mysterious paradise world, Buddy Baker - capable of borrowing abilities from animals - must find a way back home to Earth and his family. Originally created in 1965, Animal Man was, at best, a minor character until he was handed over to Grant Morrison, who gets a lot of praise for his work on the title. Grant was, of course, the third Brit brought into DC to revamp a dumb character, after Alan Moore mystified Swamp Thing and Neil Gaiman reinvented Sandman. Morrison's story had its good points, but when Grant wrote himself into a corner, he pretty much said "screw it" and took the easy way out. Deus ex machina was lazy when the Greeks did it, and it's no better now - there's a difference between being a genius and not understanding the medium you're working in. Of the five figures in 52 Series 1, Animal Man is the weakest. His design was never the greatest, even if he was one of the first comic characters to don a Members Only jacket over his costume. You know, so he had a place to keep his money and keys. Unlike so many others, though, the jacket has remained a constant for him, not just a passing fad. Contrary to popular opinion, that's not a leather jacket - one of the better things Morrison added to Buddy's personality was that he was a vegetarian and animal rights activist, and thus would never wear leather. It may have been a conscious choice to reflect Animal Man's status as an "everyman" hero, but Ray Villafane's sculpt is remarkably subdued. Especially when you put him next to the other figures in this series, like Booster Gold or Supernova. It's not the detail so much as it is the stance: Buddy's just kind of standing there, not looking very confident at all. It fits with the character, but makes for a less-than-impressive toy. The folds of the jacket are nice and his hair looks natural, and you can clearly see his face beneath those goofy goggles. 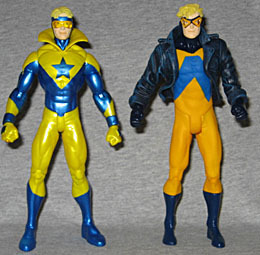 It's interesting how alike Animal Man and Booster Gold look - they could almost be twins. There are two major strikes against this figure, sadly. First of all, the paint is poorly applied. Sure, the colors are good and the lines are crisp, but that doesn't mean much if they're in the wrong place. See, the big blue D shape on his chest (it was originally a large A) is supposed to be symmetrical, but it's definitely not, here. 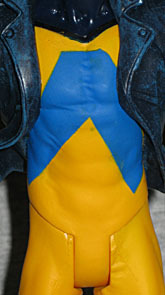 It was poorly applied to the figure, so it wraps halfway around his ribs on one side, and points straight down at the front of his leg on the other. Yeesh! If they edges of the shape had been sculpted in, that could have been avoided. Of course, there's the usual problem of DC Direct's articulation. He has a balljointed head, which you'd think would be a given these days, but with DCD you can never tell when they're going to screw that one up. His shoulders are just peg joints, rather than balljoints, because of the design of his jacket. He has hinged elbows, thank goodness, and his wrists turn whee they emerge from the sleeves. Then we've got peg hips, pin knees and pegs at the top of the boots. Animal Man doesn't have any accessories, other than the logo base, but does he need any? It's not like he adopts the physical characteristics of the animals he's copying. Which does bring up an interesting point: why doesn't he adopt the characteristics? A bird flies because it has wings, not because it just throws itself at the ground and misses. Fish breathe underwater because they have gills, but Buddy can do it without. So what's the haps? Originally, Buddy could only tap into the powers of an animal that was nearby. His powers were the result of alien radiation. Or maybe that's radiation and aliens. 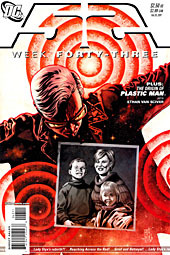 In any case, unhappy with the limitations, Grant Morrison changed the nature of A-Man's powers (a spot of laziness he'd revisit years later in New X-Men with the concept of "secondary mutations"), tapping him into something called the "morphogenetic field" and giving him access to all animals anywhere in the world. Which pretty much made him a white, male version of Vixen. Animal Man is fairly unique, in that he knows he's just a comicbook character. Of course, so does She-Hulk, but she's much less grumpy about it. In trying to show off how bloody clever he is, Morrison pretty much ruined Animal Man as a character for future writers - there's no real way to reconcile that meta-knowledge into an ongoing fictional character. However, while writing the "adventures in space" portion of 52, Morrison may have fixed that. Although he upped Buddy's powers yet again (yawn), he also dialed down the external knowledge. Way down. To the point where it was almost non-existent. And along the way, he made people care about Buddy and his family in a way they haven't in years. 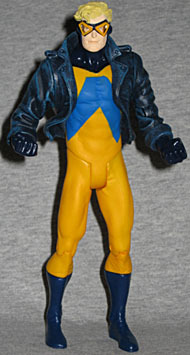 After 52, Animal Man was a hero again - this figure should just be a better representation of that.